HTC today announced the U11, a flagship smartphone that responds to squeezes along the side edge. According to HTC, the U11 will open the camera, dictate and send a text message, or even open email with a gentle squeeze. HTC calls this feature Edge Sense and says it will work under most circumstances, such as when the owner is wearing gloves. Other notable features include: support for Amazon Alexa, Google Assistant, and HTC Sense Companion voice assistants; HTC BoomSound Hi-Fi Edition speakers and custom-tuned USonic earbuds that now include active noise cancellation; and four microphones for 3D recording. The phone merges the visual appeal of the U Ultra with the specs of a modern flagship. The U11 is made from dual liquid glass surfaces and a metal frame that are resistant to water and liquid damage. The Super LCD 3 display measures 5.5 inches across the diagonal and boasts quad HD resolution. It is protected by Gorilla Glass 5. HTC gave the U11 a Snapdragon 835 processor from Qualcomm with 4 GB of RAM and 64 GB of storage. Other specs include a 12-megapixel main camera with autofocus, BSI sensor, optical image stabilization f/1.7 aperture, and dual LED flash. Shooting modes include HDR Boost, manual, panorama, face detection, hyper-lapse, slow motion, and 4K video. The front-facing camera has a 16-megapixel sensor. HTC selected a 3,000mAh battery that supports Quick Charge 3.0 via the USB-C port. Like the U Ultra, the U11 nixes the 3.5mm headset jack but includes an adapter. The U11 supports most LTE bands for use the U.S. and will be sold by Sprint with HPUE for faster performance on the company's 2.5 GHz spectrum. HTC plans to sell an unlocked variant of the phone directly to consumers via HTC.com and Amazon.com. Preorders can be made starting today and HTC expects the phone to ship in June. It will be available in black, silver, and blue. The HTC U11 costs $700. The HTC U11 is the company's true flagship phone for 2017. 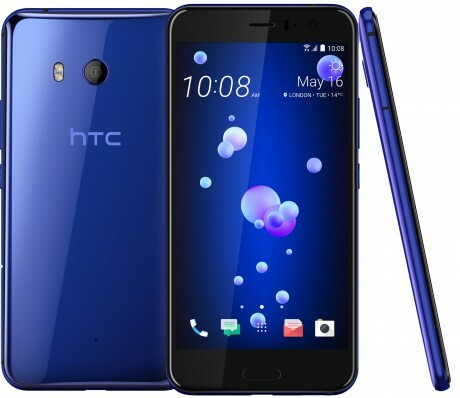 It fills the Goldilocks spot in HTC's U series: better than the U Play, but smaller than the U Ultra, while also replacing last year's HTC 10. HTC today said anyone who buys the U11 smartphone between now and the end of September will be rewarded with three months of Amazon Music Unlimited for free. The service provides access to Amazon's library of millions of songs, which can be streamed to the U11. This thing is almost a centimeter wider than the Galaxy S8. It is a 16:9 display ratio. The Galaxy S8 is 18.5:9 display ratio.